In this blog we will come to know about a very useful feature of Spring, today we will dive into Spring Security and will be able to integrate Spring Security with a Spring MVC framework. By the end of this blog we will be able to answer the questions like, what is Spring Security ? 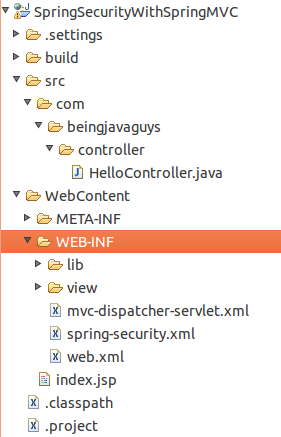 and how to implement Spring Security and its features in a Spring MVC application. In this 'Spring Security integration with Spring MVC hello world application' we will be having a simple Hello controller through which we will implement a default login form provided by Spring Security. Lets start our discussion with a quick view of overall project structure. Just start a simple 'Web Application' in Eclipse and create a project structure as shown in the figure below. 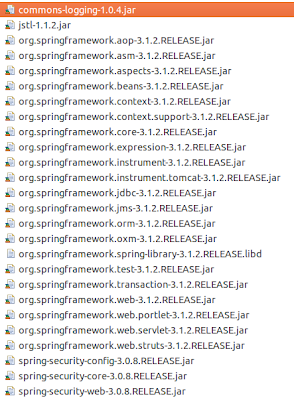 Here is an snapshot of all required Jar files that is used to create a Spring Security Hello World application in Eclipse. Apart from all basic libraries we need to add thee main libraries to add speing security feature in the application. 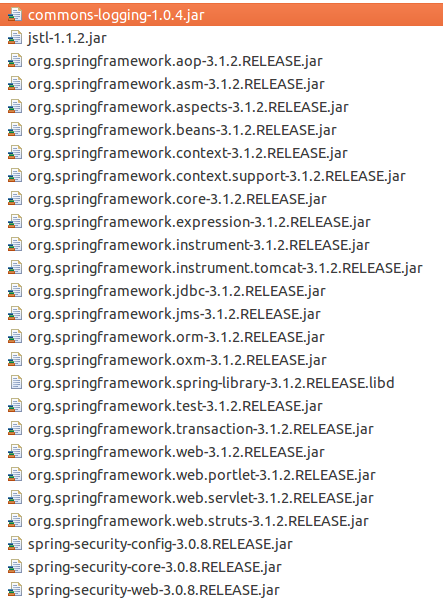 Required spring security jar files are 'spring-security-core-3.0.8.RELEASE.jar', 'spring-security-web-3.0.8.RELEASE.jar' and 'spring-security-config-3.0.8.RELEASE.jar'. The very first step to start a web application in Java is always telling the container about the Application structure and behavior and this is done by 'web.xml' file. 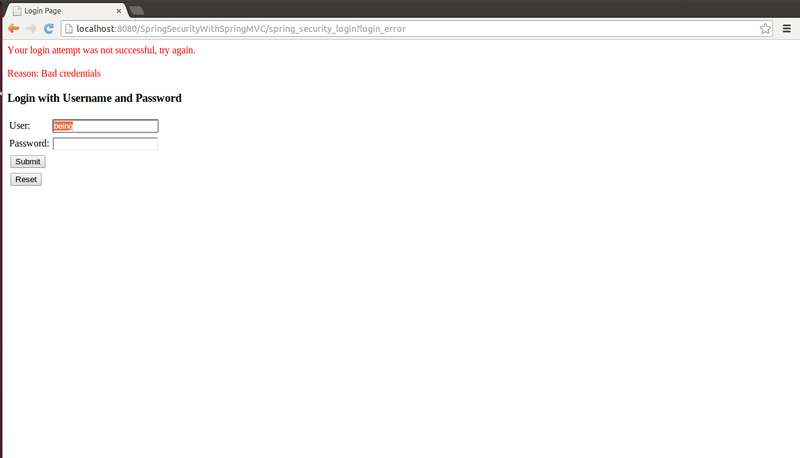 In order to make our application 'spring-security' driven we need to add some filter entries over here. We need to add a filter class entry for 'DelegatingFilterProxy', this will make all requests pass through the spring-security. Other entries are same we have added a 'SpringServlet' mapping to delegate all requests be handled by spring itself. Our application starts with a 'index.jsp' welcome file, we have added a forward entry here so that the control can be transfered to pre defined 'spring-security' controller. This will redirect the appllication control to a login form that is automatically provided by spring-security. Please note that we can always use a custom login form instead of one provided by spring security. We already knows that dispatcher-servlet is core of all spring applications, all bean entries and default package configuration id done here accordingly. This configuration file is totally related to 'spring-security' configuration and settings, all custom entries and pre defined things are configured here. A controlled is added here with a action mapping, if the user provides correct login credentials than application controll is moved to controlled and required mapping action is executed. In our case the mapping defined after successfully login is '/welcome'. This is a simple Jsp file that is mapped to '/welcome' url mapping, if everything goes right the user will be able to see this page. Here we are all done with our application coding and configuration, just run your application on server you will get a login form screen like the figure shown below. 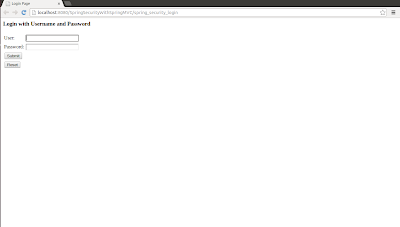 In case the user provided wrong credential, an error message is displayed as shown in below image and this is all done by spring security itself. If the user provides correct credentials, in our case username='beingjavaguys' and password = 'spring@java', then the application will move to specified view as shown in the figure below. So this was all about spring security, in details 'spring-security' is a very broad term to discuss here in a single blog. But i hope i could make you understand the basics and implementation of it. In our next blogs we will see how to use custom login form and other settings to implement our own logic with 'spring-security'. 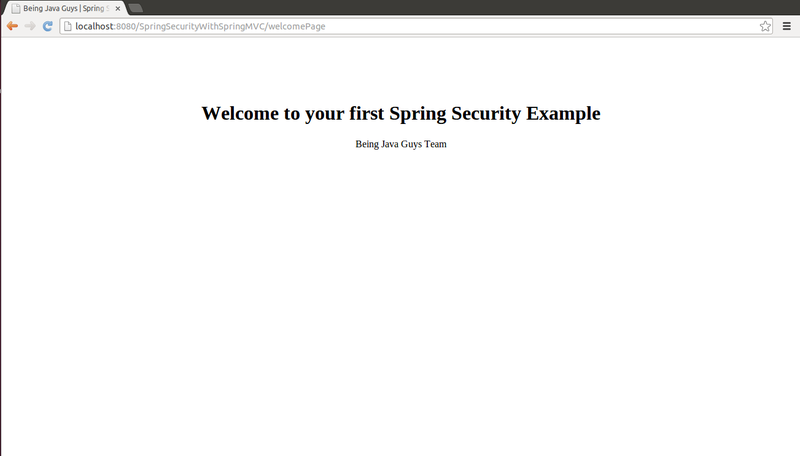 Download "Spring-Security with Spring MVC Example" from "SkyDrive"